One of the world's biggest telecoms firms and its top executive are facing almost two dozen criminal charges filed by US authorities. The US is also seeking the extradition of Huawei executive Meng Wangzou from Canada, where she was arrested 1 December at the behest of American officials. The impact of the case could be complex and wide ranging: it comes at a sensitive time in the China-US relationship and amid Huawei's rapid growth. It has also raised diplomatic tensions between China and the US and Canada. We've summarised the key points of this story. You can choose to read the short, medium or long version below, either by themselves or one after the other. Why is the US targeting Huawei, one of the world's largest smartphone makers, and executive Meng Wanzhou? Authorities claim they misled the US government about the company's business in Iran, which is under US economic sanctions. The US is also pursuing Huawei and Ms Meng in criminal charges including bank fraud and theft of technology. Both reject the claims. US officials want Ms Meng extradited from Canada to face the charges. Her arrest caused a diplomatic dispute between China and the US and Canada. The case against Huawei also comes as Western nations grow increasingly concerned about a possible spying risk related to the widespread adoption of the company's technology. The arrest of the high-profile Huawei executive at the request of US authorities infuriated China. Canada says it's only following the rule of law in Ms Meng's extradition case, but that has not appeased Chinese officials. They have accused Ottawa of being part of a US-led "witch-hunt" against Huawei. The dispute has caused a significant rift between the two countries. Many observers believe that two Canadians have been detained in China in retaliation for Ms Meng's arrest. Canada has also accused China of "acting arbitrarily" by imposing the death sentence on a third Canadian national in its custody. Canada was acting under its extradition treaty obligations to the US, which wants Ms Meng and Huawei to face fraud charges relating to the alleged breaking of its sanctions on Iran. The US Department of Justice also filed a host of additional criminal charges in January against the firm, including allegations it stole trade secrets. The charges are the most serious Huawei has ever faced and they come as international pressure on the tech giant - which made over $92bn (£69bn) in total revenue in 2017 - grows. More and more Western nations are reviewing doing business with the firm over spying concerns. Huawei has always maintained it acts independently. Still, Germany considered blocking it from its next generation 5G mobile network, which uses new technology to boost network speeds and improve connectivity. The technology is being rolled out in many countries before 2020. Canada is reviewing Huawei's role in the mobile network and the US and Australia have already closed the door on the firm's involvement. Further complicating matters is the ongoing trade dispute between the US and China, the world's two major economic powers. In December, Donald Trump created controversy when said he could intervene in Ms Meng's case if it helps to avoid a further decline in US relations with China. While the US says the charges against Huawei are not about the trade tensions, it is unlikely the Chinese will see it the same way. The two nations are engaged in a trade war that has seen both impose duties of billions of dollars on one another's goods, though they are currently in talks in an attempt to resolve the dispute. Lawyers for Ms Meng have said she should "not be a pawn or a hostage" in the trade dispute. To understand the significance of Meng Wanzhou's arrest, it helps to know that Huawei is one of the largest telecommunications equipment and services providers in the world - as well as a symbol of China's ambition and innovation. As this article explains, Huawei has become the poster child for China's dynamic tech sector, and recently overtook Apple in the number of handsets it was shipping worldwide. So when a top executive - who also happens to be the daughter of the firm's founder - was arrested in Vancouver it sparked an immediate response. Canada says it has been acting in accordance with its extradition treaty obligations and the rule of law. When news broke that Ms Meng had been detained, China's embassy in Canada was quick to protest the arrest and demand her release. Chinese officials have called her arrest a "serious mistake" and accused Canada of double standards and "Western egotism and white supremacy". There were threats of "grave consequences" if Ms Meng was not released. Not long after her arrest, two Canadians - former diplomat Michael Kovrig and businessman Michael Spavor - were detained in China on allegations of endangering Chinese national security. A third Canadian, Robert Schellenberg, is facing the death penalty in China. Schellenberg was initially given a 15-year jail term in November for drug smuggling, but a court increased his sentence in January following a brief retrial, saying the original sentence was too lenient. The Canadian government has called both the detentions and sentencing "arbitrary". It has asked for Mr Spavor and Mr Kovrig's immediate release and for clemency for Schellenberg. Canada has also rallied international support from Western leaders for the two detained men and Schellenberg. What are the US charges? Donald Trump last year reinstated all the US sanctions on Iran that had been removed under a 2015 nuclear deal. A second indictment alleges Huawei stole technology from phone company T-Mobile used to test smartphone durability, as well as obstructed justice and committed wire fraud, which Huawei says was settled in a civil case filed in 2014. The allegations by the US Department of Justice go to the heart of the current trade war between China and the US. Chinese officials have called it a US attempt to "smear and suppress certain Chinese companies". And Huawei founder Ren Zhengfei told the BBC in February that he believed the arrest of his daughter was politically motivated. Critics question how free Huawei can be from Beijing's influence. Mr Zhengfei was a former engineer in the country's army and joined the Communist Party in 1978, a track which has worried governments already distrustful of China's political leaders. Huawei says it has an excellent record with clients and no links to the Chinese government. It insists it is an independent company, one that has grown in recent years to become a tech industry leader. The privately held firm does much of its business overseas and is a market leader in many countries across Europe, Asia and Africa. US intelligence agencies have been warning that Huawei poses a potential security risk for years, and the US government has taken a series of steps to block the firm from the domestic market. Other Western countries have begun reviewing their relationship with Huawei, specifically with regards to its technology being used in new "fifth generation 5G" mobile internet networks. 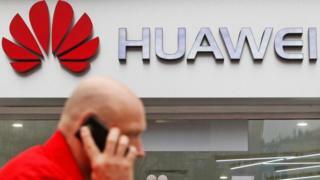 In the UK, a 2019 report from the Royal United Services Institute, a defence and security think tank, said it would be "naive" and "irresponsible" to allow Huawei to access the country's telecommunications system. Ms Meng is currently out on bail and under house arrest in Vancouver, where she owns property. In March, Canada's Department of Justice authorised Ms Meng's extradition process to begin, though that decision was an early step in the process. Ms Meng does have avenues to appeal throughout the process. She could also voluntarily waive extradition. She is next due in court on 6 March, when her hearing date will be scheduled. Concerns have also been raised about whether comments US president Donald Trump has made could have an impact on the extradition case. He has twice suggested he would intervene in the US Justice Department's case against Ms Meng if it would serve national security interests or help achieve a trade deal with China. US Commerce Secretary Wilbur Ross said since said the charges are "wholly separate" from the trade negotiations.